In Government by Referendum, Matt Qvortrup makes the case that rather than pose a challenge to democracy, referendums are a force for good and can work to enhance it, provided they are not exploited opportunistically by governments and politicians. This concise book contains many thought-provoking observations and factual details, finds Chris Stafford, that serve to underscore its key message that referendums should be embraced by the public and demanded more regularly. Government by Referendum. Matt Qvortrup. Manchester University Press. 2018. ‘If we want to destroy Europe, you only need to hold more referendums.’ These were the words of Luxembourg’s Foreign Minister Jean Asselborn after Dutch voters rejected a European Union-Ukraine association agreement in a referendum in April 2016. This by itself caused EU officials quite a headache, but was only made worse just a few months later when UK voters opted to leave the EU in a referendum of their own. In the aftermath of this vote, many commentators were quick to echo Asselborn’s comments, arguing that the UK example had decisively proven that referendums were a bad idea. Such sentiments were also expressed at the inaugural ‘Represent’ conference at the University of Birmingham in April 2018, where a local MP spoke on the referendum and argued that they were too much trouble and that the UK should never hold one again. Shortly afterwards, Matt Qvortrup took to the lectern and passionately argued the opposite – that countries like the UK should actually have more, not fewer, referendums. Sadly, the MP in question had to leave the session immediately after their contribution, so Qvortrup could not try to convince them of his point of view personally. However, should that MP or anyone else wish to understand the reasoning behind these arguments, they can all be found in Government by Referendum, which ultimately makes the case that referendums can be a force for good and enhance democracy, providing they are used ‘correctly’ and not just by opportunistic politicians to further their own aims. Government by Referendum is a fairly short book, coming in at just under 100 pages, but it is full of interesting information and thought-provoking observations. The first chapter provides a concise yet detailed world history of referendums and shows that they have been around for much longer than many people assume. It then attempts to explain why they appear to have been used more frequently since the 1980s, linking this to the dealignment of voters from political parties and the need for these parties to ‘opt out’ of making certain difficult decisions – thereby highlighting the theme that for much of their history, referendums have been tactical tools for the political class. The second chapter refines the focus and details the history of referendums within the UK, showing that until recently they were theorised about and promised more than they were actually used. The third chapter then takes a closer look at the most recent and divisive referendum in the UK: that on EU membership in 2016. The fourth chapter moves away from this UK focus and seeks to outline and debunk a popular myth about referendums in general, which states that they are mainly used by populists to circumvent parliaments and implement their own agenda. It is argued that it is actually very rare for populists to use a referendum for their own gain and even rarer for such a strategy to succeed. In addition, Qvortrup reveals that the most recent referendums outside of the UK have actually been citizen-initiated and, as a result, have served as a safeguard for democratic processes. The final chapter is the conclusion, deftly summarising the main points of the book and posing questions for the reader to consider further. As may be noticeable from this description of its structure, the text covers some broad issues which, although clearly linked, can lead the book to feel a little disjointed at times. However, this is a minor criticism, and in the introduction the author himself notes that the book was once intended to be part of a larger whole. As the work progressed, this changed so that the book is now ‘a series of “remarks” and “sketches”, which together form a mosaic rather than a coherent whole’. Regardless, it still reads well and is easy to follow, the text itself conveying a lot of information and some interesting ideas in a plain and comprehensible manner, with some dry wit and humour aiding this. A key argument of the book is that although referendums have been given a bad name recently by examples including that on the UK’s membership of the EU, such instances are the exception to the rule. The overall development of the referendum, it is claimed, has seen it perform a healthy function in many democracies. In countries such as Ireland, where constitutional changes have to be put to a referendum, or Italy and Switzerland where citizens can initiate a referendum on an issue, the referendum can serve as a direct veto on unpopular policies. In addition, it can also indirectly influence policy by providing politicians with heavy incentives to deliver policies in line with what the people want in order to avoid a referendum and a potentially embarrassing defeat in the future. Of course, this is not without some potential disadvantages, one prominent example being Switzerland, where government attempts to enfranchise women were constantly voted down in referendums until women’s suffrage was finally granted in 1971. However, Qvortrup is keen to point out that the positives of referendums can greatly outweigh the negatives. 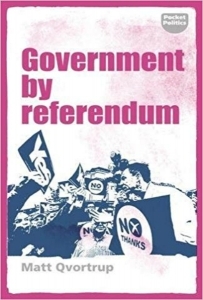 So, while for many people their recent experiences of referendums may suggest that they should never be allowed to happen again, the key message in Government by Referendum is that they should actually be embraced by the public and demanded more regularly. It is argued that the problem with referendums, especially in the UK, is that they are usually used for narrow political purposes by the elite, whereas it should be a check on their power akin to a more democratic second chamber, keeping them in line. As Qvortrup puts it, to work effectively, the referendum should be the people’s shield, not the government’s sword. This review gives the views of the author, and not the position of Democratic Audit. It first appeared on the LSE Review of Books blog. Chris Stafford is a PhD student at the University of Nottingham, focusing on democracy and representation. His current research investigates how MPs have reacted to the result of the EU Membership Referendum and how this relates to the opinions of their constituents. I look forward to reading the book, which I will. But one comment in the article – which includes an understandable inconsistency – points to how for many a referendum is only good if its outcome reflects what their view is. And it can be very divisive and polarising. The author of the article suggests, probably correctly, that it is ‘rare for populists to use a referendum for their own gain’ or succeed. But then goes on to point out that the referenda in many places have been ‘citizen initiated’…surely, in the end, the two are really the same. The word populist is often abused to mean “someone campaigning for something I don’t approve of and which the people appear to support”, but somehow the same words dressed up as ‘citizen’s initiative’ do not carry the same emotion…but they mean the same. People asking for something that they want to be done. For example to stop migration (the ‘citizen’s initiatives’ on that in Switzerland). Described as populist by those who disapprove of the initiative. It is, by the way, useful to look a bit further into the reason why Switzerland voted against even letting the politicians go to the first stage of EU membership in 1992. An EU Commissioner appeared on tv at the time making clear (quite correctly and honestly) that the Swiss would have to mostly abandon their tradition of referenda because the process was not communautaire. Indeed so. How can an EU state have any referenda on almost all of the subjects that have been the case in Switzerland, as these matters are decided centrally by the EU institutions? Just look at an annual list helpfully published on wiki. Pick a year, any year.